I know that usually they are filled with small gift or candy, but why not a gift card ? So it will be my next gift card holder ! DCWV has a stack with Winter party favor boxes with one template for a cracker and by chance, a gift card can perfectly fit in it ! I just change the edges of the cracker by using my own craft scissors instead of the initial pattern. Few ribbons to make a bow at the edges and you're done ! Super cute box, I sure wouldn't mind getting a gift card wrapped up in a cute package such as this. Great idea. 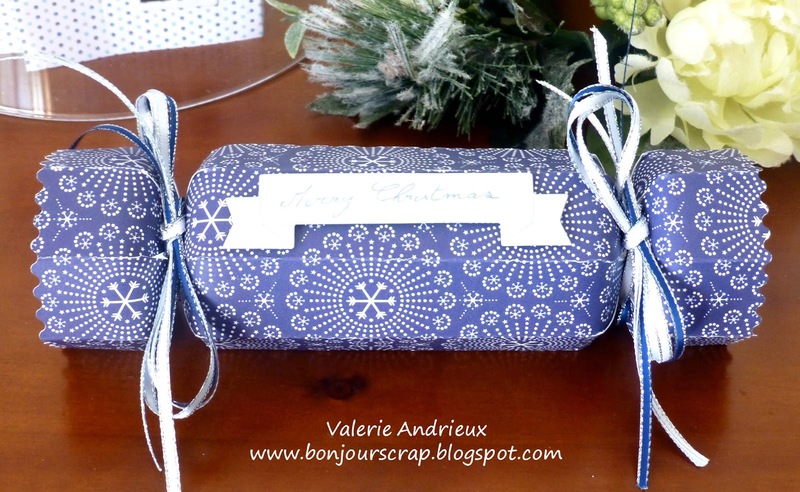 What a fun way to use those cracker favor boxes! I like the way you customized the DCWV template to fit your needs! Such a fabulous idea!! I haven't ever had a Christmas Cracker box so will be looking for this DCWV Stack to buy for just that offer!! Great idea to use your fancy scissors to make it even more special on the edges!Love the deep blue pattern of this DCWV paper too!